Priscilla (Cilla) Stirling is the Head Coach at Carrickfergus Gym and Trampoline Club in Northern Ireland, and has played a major role in the success of the club since it opened. In 1980 Carrickfergus Leisure Centre opened up its own gymnastics club. Cilla’s two daughters joined the club, and that was the start of her ongoing 38 years in the sport: "To help them I became a volunteer and enjoyed helping out." 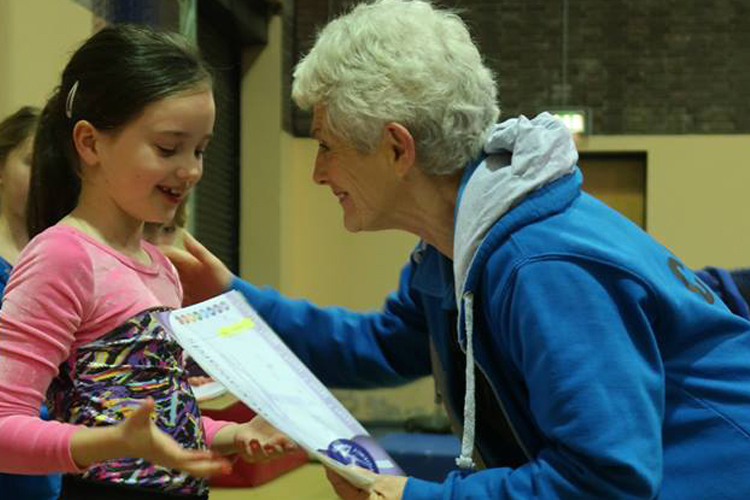 From that point on Cilla was hooked and soon began to learn the intricacies of coaching gymnastics: "I decided I needed to learn the basic skills properly. I became qualified as a level one coach in women’s artistic and had a real passion for the sport. From there I went on to be a preschool, sports acrobatic and a general gymnastic coach." Three years on from first walking in to the club, Cilla took over Carrickfergus in 1983 and is still there, making a difference to so many people in the community: "The exciting part is that I’ve been there that long I now coach second and third generations. I certainly never thought I would still be coaching after 35 years. "The best part is seeing how children progress and how it gives them confidence. Also mentoring over 30 up-and-coming coaches." Cilla is well placed to advise new coaches, and as far as advice goes, it doesn’t come much better: "Have a passion for the sport and enjoy what you do! Never be afraid to ask or seek advice and if you are enthusiastic about the sport of gymnastics it will get results. Always remember the gymnasts are precious and they will thrive on your enthusiasm." On Tuesday this week, Cilla was chosen from over 7,500 to attend a royal garden party at Buckingham Palace and spoke with HRH Prince Charles about the continued work she does in gymnastics. Cilla is a brilliant example of someone who first walked in to a gym club simply as a parent encouraging their children. That first visit to Carrickfergus began a career in coaching that she still continues to this day. If you would like to follow in Cilla’s footsteps and become a gymnastics coach, find a course for you.